The invention of the telescope allowed us to explore planets and stars and thus better understand the relationship of man with the Universe. In the same way, the microscopes opened the door of another until then unknown world that would become essential for the later development of civilization. Antony van Leeuwenhoek (1632-1723), together with Robert Hooke, was one of the first to discover the microscopic universe thanks to the use of microscopes manufactured by himself. He described previously unknown ways of life and stablished the foundations for new branches of science that would explain many biological processes, hitherto a field of speculation, often with religious influences. Perhaps he was not aware of the historical importance of his observations or the value they would have in understanding life, but he opened a door for man to change the point of view of his relationship with nature. Leeuwenhoek is considered to be one of the fathers of microscopic biology, especially of microbiology. 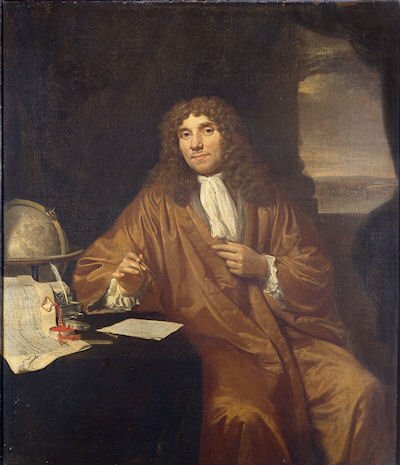 Antony van Leeuwenhoek painted by Jan Verkolje. Rijksmuseum, Amsterdam, Nertherland. Antony van Leeuwenhoek lived in the 17th century, the golden age of Holland, both politically and economically. It was the moment when great scientists, painters and writers emerged. He was born in 1632 in the Dutch city of Delft, which was the fourth largest city in Holland. Therefore, Leeuwenhoek lived in probably the most prosperous region of Europe. By the age of 16, he entered as an apprentice with a linen merchant in Amsterdam. When he was 22 years old, he returned to his hometown and married Barbara de Mey. They had 5 children of which only one exceeded childhood. His wife also died soon. In 1654, he bought a house in Delft and set up a shop of cloths. In 1671, he married Cornelia Swalmius, with whom he shared his life until 1694 but had no children. He died in 1723. He performed several jobs for his city. In 1660, he went to work as a chamberlain, a position in which he worked for the rest of his life. This work, although it was not very lucrative, left him a lot of free time to devote his hobbies and to do other tasks for his city as a surveyor, after passing an exam where mathematics were a requirement, and also as a "measurer" of wine (he calculated the quantities of wine that were in the barrels of wine growers). He combined all these works with his hobby, manufacture microscopes and observe tiny things. As his observations spread, he gained fame and social consideration, and received visits from illustrious figures of the time such as Peter I of Russia, James II of England or Frederick II, the great, of Prussia. The lenses began to be used to help the eye and increases of 2 or 3 times were sufficient. After that, telescopes were invented with the series placement of two lenses. Galileo in 1600 already used them (although he did not invent them). It was a matter of little time to realize that two lenses placed in the proper position and orientation also served to see better small things. In 1606, Galileo already had one that could increase things 20 to 30 times. However, these first lenses had numerous aberrations, so the observations were difficult to interpret or simply the descriptions were wrong. It was not Leeuwenhoek who invented the microscopes, because compound microscopes (with two lenses) already existed when he was a child. The first microscopes are attributed to Lippershey and Janssen (1600), but there is not clear evidence. The first microscopic publications are by Federico Cesi (1625) and Francesco Stelluti (1630). Van Leeuwenhoek microscopes. In the image on the left from several points of view. 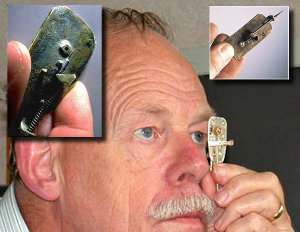 In the central part of the microscope appears where it was observed and in the right part of the device where the sample was placed (Images of the site Lens on Leeuwenhoek by Douglas Anderson)..
Leeuwenhoek came into contact with the lenses at the age of 16, when he worked in the trade of cloths, since lenses were used to check the quality of the fabric. The lenses and microscopes that were in the market at that time did not offer him enough confidence and he learned to carve glass and to manufacture his own lenses, getting some of a diameter of 1 mm. He developed his own technique of polishing glass that he never wanted to explain to anyone, so his carving technique remains a mystery. Size of the microscopes manufactured by Leeuwenhoek (Images from the site Lens on Leeuwenhoek by Douglas Anderson). His microscopes had a single lens fixed between two riveted metal sheets. The samples were placed in a screw that he approached or moved away of the lens to focus. The focal length was very short, which prevented the observation of large samples and the need of tangential illumination. In spite of this, he made some modifications of this design to observe large samples. With his mastery polishing glass, he built lens that were capable of increasing up to 250 times, much more than could be achieved at that time with compound microscopes. In addition, with a single lens, he avoided many chromatic aberrations suffered by the compound microscopes of that time and provided much sharper images. Leeuwenhoek did not begin to publish the first results of his observations until he was about 40 years old, although he had begun to obtain them much earlier, and produced his last writings with more than 90 years. He did not know Latin, did not attend scientific meetings and had no contacts with universities, except in his last stage with some members of the Royal Scientific Society of London. He was a self-taught observer of the microscopic nature of everything that surrounded him and that he later expressed in his writings. Studying his publications it can be concluded that his work did not have a plot line in the sense of not following a permanent line of research but his letters dealt with many different topics. That is, he did not specialize in any specific topic. Reiner de Graaf, contemporary of Leeuwenhoek and who gives the name to the ovarian follicles of Graaf, knew his observations and suggested him to publish his descriptions. In 1673 he writes and presents his first observations in "The Philosophical Transactions", publication of the Royal Society of Sciences of London ("Royal Society"), in which he describes the structure of the mold and the one of the sting of the bees. For the rest of his life he sent to this institution a total of 375 letters and 27 to the Academy of Sciences of Paris. In 1680, he joined the Royal Scientific Society of London and in 1699 of the Academy of Sciences of Paris. 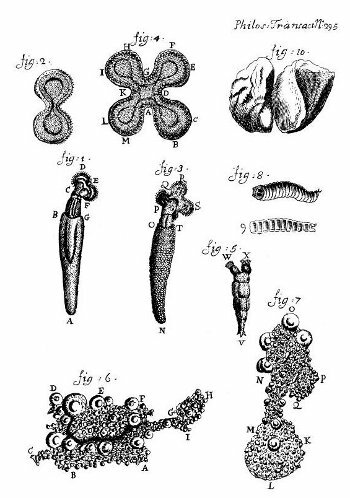 Drawings made by Leeuwenhoek (1683) of what could be the first bacteria observed by a human being (Images from the site Lens on Leeuwenhoek by Douglas Anderson). 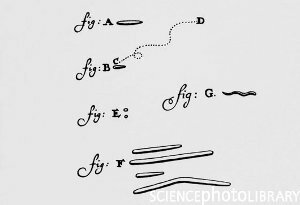 In 1676, he describes the bacteria and the first drawing of a bacterium appears in 1683, in Philosophical Transactions. Therefore, he is considered the father of microbiology. Interestingly, the members of the Royal Scientific Society of London did not believe his first letters of descriptions of microorganisms. Mainly because no one was able to see what he described, since the power of his microscopes could not be compared with the simple lens of Leeuwenhoek, and he never said neither taught anyone how to make such microscopes. It was thanks to the influence of Robert Hooke, who in 1665 had given name to the cells of cork sheets, who supports him and confirms his descriptions later, with the improvement of his own microscopes. It could be said that Hooke and Leeuwenhoek were the first to see microorganisms. He wrote several letters about the bacteria of his teeth, and he came to write. "There are so many animals in the scraping of the teeth that they are probably more than the number of men in a kingdom". He started not only to observe but also to investigate the resistance of these microorganisms in different environments, such as heat, hot coffee, acid, etc. He was also perhaps the first to prepare a medium for cultivating microorganisms, so that in one of his experiments he established culture conditions that later allowed him to describe anaerobic bacteria. Drawings made by Leeuwenhoek (1699-1701) of rabbit and of dog sperm (Images from the site Lens on Leeuwenhoek by Douglas Anderson). 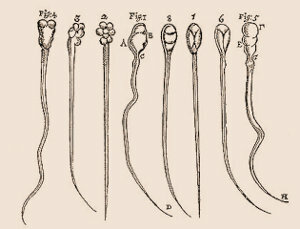 In 1677, he describes for the first time the sperm of several species, including humans. He was even the first to recognize that it was the sperm that entered the ovule during fertilization. This was an important discovery to know the formation of individuals. 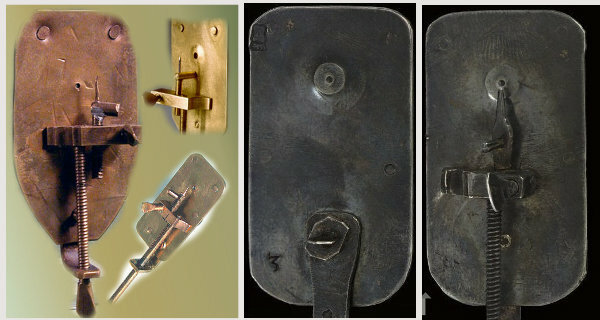 Drawings made by Leeuwenhoek in the communication number 160 send to the Royal Scientific Society of London in 1704. In 1684, he studies red blood cells, blood cells and the transparent tissue irrigation system. He described the blood flow of the cerebral convolutions, the structure of the lens of the eye; he discovered the rods of the retina, the connective tissue and epithelium of the cornea, the striated appearance of the muscles. He cut his own material with blades, but it was material not embedded. He also studied the life of the ants, discovered that the pupae were not eggs, but that the latter were smaller, and gave rise to the larvae. He also observed the reproduction of the eels, which at that time were supposed to come from the dew. When many people thought that worms, fleas, and similar organisms appeared by spontaneous generation, he saw them come out of the eggs. Therefore, he was contrary to the spontaneous generation of these organisms. In fact, in the description of his experiments, his concern for contamination is appreciated and, therefore, he is aware of the organisms appearing because they come from another side, not because they arise spontaneously. But the list of descriptions is very long: feathers of birds, hairs, scales, he studies the anatomy of numerous insects, the structure of leaves and wood of many species. He described the yeasts in the ferments of beer and wine, also inanimate elements such as gunpowder, metals, materials, cloths, etc. Porter, J.R. Antony van Leeuwenhoekl: Tercentenary of his discovery of bacteria. Bacteriological Reviews. 40(2): 260-269 (1976).